In photos, Harvest C.R.O.P.S makes delivery to Broken Loaf Food Bank at IB Methodist Church. 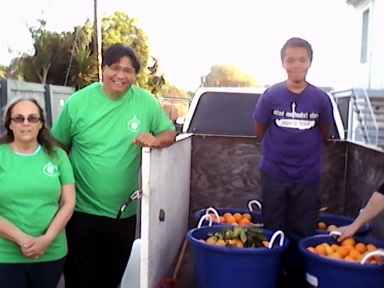 "Harvest C.R.O.P.S" will help Pick & Donate your Excess Fruit & Produce to help the Needy. Licensed and insured non-profit pick your excess fruit and produce and make available to your local Food Bank. Receive a notice when harvest is scheduled. Simply fill on-line form and that's it. Be on our Email Notice List. Residential owner of fruit trees, allow us to make a harvest appointments at your convenience each seasonal year. Tax-deductible, your gift, supports our non-profit operational needs. Please sustain our mission with a cash or equipment donation. Thank you.